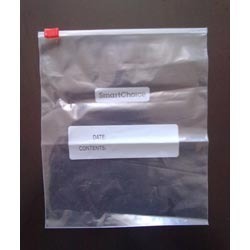 We are involved in offering to our valuable customers a comprehensive range of Standard Slider Bags. Developed using premium quality raw material and with the aid of sophisticated machines & tools, this range is in compliance with the latest industry trends & norms. Widely known for its supreme quality, waterproof nature and high durability, this range has generated a huge demand in the market. As a manufacturer, we ensure that this range is made available in various shapes & sizes so as to meet the diverse requirements of our clients.